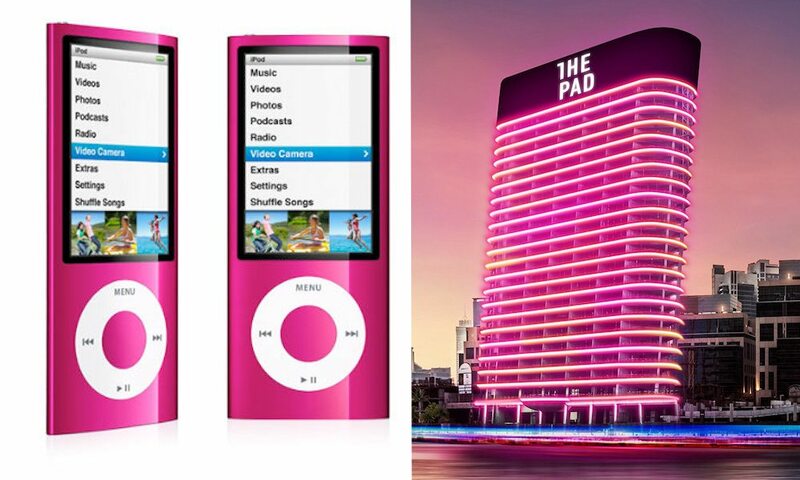 The architect of a highly-advanced housing complex currently under development in Dubai, United Arab Emirates, says his building’s design is largely inspired by Apple’s popular iPod nano mp3 player. The building, a 24-story high multi-unit housing complex dubbed The Pad, has been under construction since as far back as 2006, according to its principal designers and builders at Hong Kong-based James Law’s Designs. Originally slated for completion and opening in 2010, the development has over the years weathered its fair share of economic set backs, forcing severe delays and pushing the project up to its current stage. The building is now slated to open sometime before the end of 2018, Business Insider reports. Although The Pad concept has been over a decade in the making, the finished product will resemble far more in the way of technological advancements than the original goal. The structure, itself, resembling a second-generation iPod Nano placed in its charging dock, is tilted back slightly (6.5-degrees) against the ground beneath it, rounded off with polished, curved edges to exude Apple’s signature stylistic hues. The building is comprised of 231 “intelligent apartments”. Each apartment will be equipped with high-tech luxuries including a location-based virtual reality projection wall (dubbed iReality), a high-tech bathroom capable of analyzing an individual’s health statistics and displaying that information on the mirror, as well as advanced RFID tag access replacing traditional keys. In designing The Pad, Law explains that his vision was not only of creating a structure that resembles Apple’s sleek yet sophisticated iPod, externally, but that also housed intelligent software within itself, rendering the walls capable of helping residents “curate the enjoyment” of their lives, such as controlling music, photos, data and more in the comfort of their home.